This is the third post in a series investigating vibrancy in LA through listening to the streets. Click to see the first post and the second post. It’s a sunny Saturday afternoon and Shmueli Gonzales is taking me through Boyle Heights, the neighborhood in which he grew up and now works closely with as an organizer. Staying within the three-block radius around the Soto Station on E. Cesar Chavez Boulevard we engage with the live sounds and sights all around us on our walk. Shmueli shares community stories and I follow up with questions about their social, political, and economic significance. Together we are participating in a soundwalk, an in situ interview about and through sound that allows me to explore the meaning of neighborhood vibrancy with a community expert. In the final post of this blog series about LA Listens, a multidisciplinary exploration of neighborhood sounds in Los Angeles, I take an ethnographic approach to delve deeper into how sound mediates the social and economic relations of Boyle Heights. Sounds communicate not only who is saying what, but also how something is being said. In some instances, the intent and power relations of a social interaction can be heard through a close examination of the volume, tone, and technological vehicle through which an expression is delivered. In other instances, sound is an incidental byproduct of an activity. In both cases sound can reveal hidden social dynamics that go beyond what is seemingly sanctioned within and outside of a community. The development proposals elicit a tension around the role of mariachis in the local economy. For the musicians, Mariachi Plaza is an active place of music commerce. But the developers and the city imagine the space as a backdrop for hip downtown dwelling with a historic cultural flair. Their plans do not consider how the mariachi musicians will continue to do their business. Furthermore, in their response to the developers and transit officials, community members talk about mariachi as a part of the local “culture” that calls for “preservation” efforts. The language of preservation implies that mariachi is a part of the historic landscape of the neighborhood, a cultural relic of the past with needs for preservation. Both of these views overlook the mariachis’ dynamic contribution to the public sphere. Mariachis as active performing professionals have played critical part of the local economy since the 1950s (Lamadrid 2013). 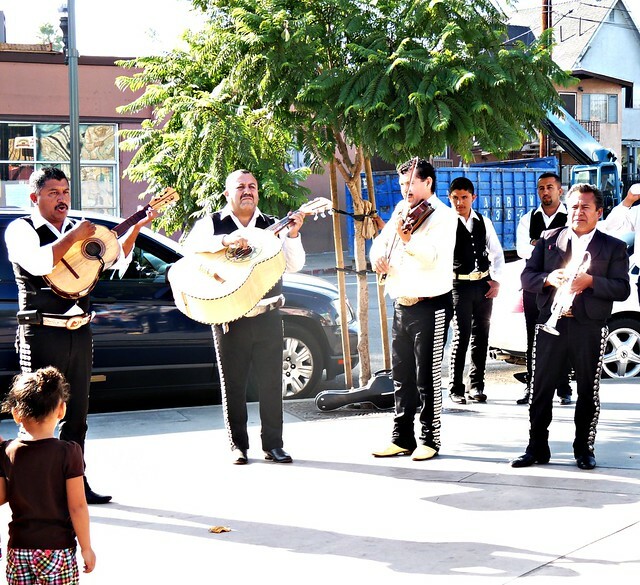 The silencing of mariachis’ voices in discussions about development and gentrification poses a stark contrast with their lively hustling and bustling in the neighborhood’s soundscape. Mariachi is a living itinerant performance practice that has thrived through successive social and economic changes. Their ambulatory business model and partnerships with local restaurants and businesses require entrepreneurial thinking and business ingenuity. The assumption of mariachis’ role as passive in the local economy excludes the consideration of the musicians’ material reality as professional musicians. Listening more closely, through the vehicular traffic sound wall and urban planners and developers’ assumptions about the musicians’ role in the local economy, we can better understand the following: how the mariachis articulate their life through songs about love and hope; and how the musicians maintain their artistic vitality and business viability as the neighborhood undergoes economic changes. Across the street from where Shmueli and I walk, I see a couple of mariachi musicians, wearing their silver studded costumes, dancing to the techno music blasting from the power speakers in front of a Cricket Wireless storefront. Swaying to the electronic beats, they seem to be having a good time. A laptop DJ plays MP3s through a set of power speakers at a volume that almost entirely drowns out the sounds coming the other parts of this street intersection. 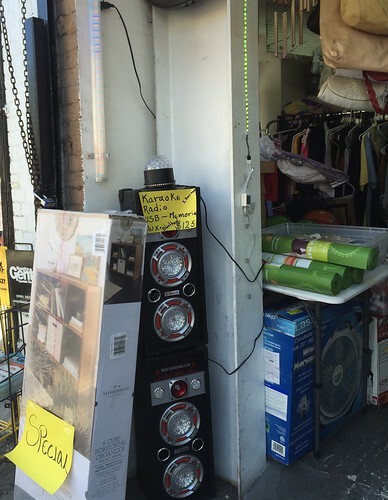 Meanwhile, on my side of the street, in front of a second hand store, a USB propelled karaoke system blares ranchera and norteño, recorded sounds of regional Mexican music. Shmueli tells me that businesses in Boyle Heights use music and sounds to attract customers. Sounds play a central role in the entrepreneurial practices of the local businesses. This kind of “volume war,” where Cricket Wireless, a national telecommunication cell phone service provider, pumps out sounds that are substantially louder than local merchants, exemplifies the encroaching of big businesses in a neighborhood with an economy primarily supported by local and small businesses. Listening to the differences in amplitude and performance style (a laptop DJ with powerful sound speakers hired by Cricket), we can begin to hear the emerging presence of businesses that are out of scale with the current local economy. Sound and space are inextricably tied to one another. In a public space, sounds can travel across various layers of the street — from interior to the exterior. Music from a storefront sound system, vendors hollering for business while pushing a cart of strawberries over the cracks in the sidewalk, Christian evangelist disseminating religious messages over a megaphone, mother and daughter conversing with a vendor selling flower bouquets in buckets on a truck bed, passing cars blaring the sounds of a button accordion in a norteño song on the radio. These are just some of the permeable layers of sounds that reverberate between the storefront, sidewalk, and road– the infrastructural tiers that make up public space. Sounds can move across the hard architectural and street structures, and travel from private to public, as people gather, trade, and socialize. In the image below, I have annotated the permeable sound layers of a street. Some sounds are localized while others render themselves as an immersive, over-encompassing experience. Unlike localized sound sources like the sidewalk karaoke system, the LAPD helicopters frequent neighborhoods of Los Angeles while projecting an immersive sound that envelopes the space completely. Shumeli tells me that residents of Boyle Heights refer to them as “ghetto birds.” The loud, low-frequency sounds from these helicopters mask sounds from other localized sources. Some residents consider these helicopters as a bad omen. Others experience feelings of comfort and nostalgia because they associate helicopter sounds with home. One common local response is to first point at the aircraft and then inquire about the reason for this particular instance of surveillance on social media. For residents, the sheer presence of these out-of-the-human-scale machine sounds, activates an impulse to interrogate one’s surrounding with questions related to community and safety. Brandon LaBelle notes that “Sound creates a relational geography that is most often emotional, contentious, fluid, and which stimulates a form of knowledge that moves in and out of the body” (2010 272-277). The understanding of helicopters’ sonic impact on social life in a neighborhood needs to be nuanced through both considerations of the physical parameters and the varied emotional responses it generates from residents. Sounds can territorialize a space but whose space is being occupied by whom (and how these boundaries are defined and enforced) is a social question. Listening to the sonic dynamics of a place may help us understand the social and political struggle of various entities at play: residents, government, police, shoppers, vendors, planners, developers, businesses, etc. Finally, sense-based engagement can cultivate empathy and connection. My soundwalk with Shmueli got me to listen from his perspective as a community member. Good listening practices can lead to inquiry that sparks discussions. Beyond jumping into conclusions about the meaning and impact of what we hear, we should ask, who is vocalizing/sounding, what are they saying, how are they saying it, why are they saying it? Urban planners should listen more carefully to what constitutes neighborhood vibrancy. As planners are designing to create neighborhood-level change, ask yourself if you are: 1) hearing the sounds or voices that dominate and how they dominate a space; 2) and you are listening through the layers of sounds and assumptions to identify who and what is out of the current discourse about change. As Shmueli and I turn away from E Cesar Chavez Avenue to circle around the neighborhood back to the Metro station, I hear sporadic rattling sounds of objects loosely positioned on the back of a metal collector truck, construction workers blasting and singing along to ranchera ballads while renovating residential properties, all against the constant humming of high-speed traffic on Interstate Highway 5. These sounds tell me a bit about the livelihood of the informal metal recycling business, the recent economic development in the neighborhood that threatens displacement for some residents, and the memory of the multiethnic neighborhoods demolished by highway construction in the 1950s. Listening to the sounds and the stories they provide, I continue to learn about Boyle Heights. Lamadrid, Enrique, R. 2013. 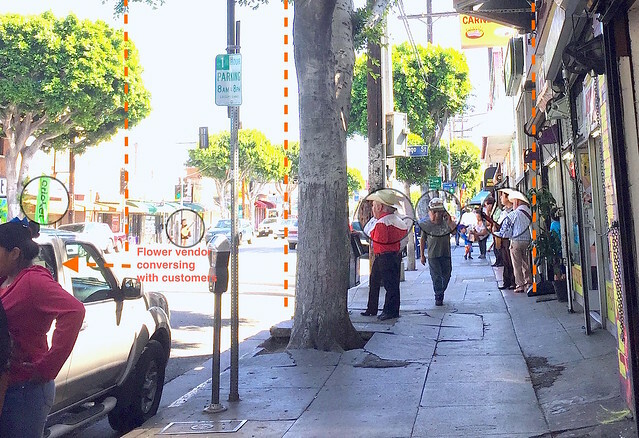 “A Paen to Santa Cecilia, Her Fiesta, and Her Mariachis,” Hotel Mariachi: Urban Space and Cultural Heritage in Los Angeles. Albuquerque, N.M.: University of New Mexico Press. Wendy Hsu is an ethnomusicologist and sound ethnographer working on public humanities and civic design projects.